No one really knew the damage Debbie would cause and for most people it brought tragedy to their everyday lives and their homes. But for one person, this was an opportunity for having the biggest natural makeover in one night. Cyclone Debbie came with its mighty winds and rain then powered its way through Te Urewera. The winds too powerful for our trees were found on the ground lifeless. Our rivers and streams flowed viciously with a deafening roar causing the earth beneath to become soft and frail creating slips and damage to structures. Te Urewera was evacuated the very next day and signs went up to close the Great Walk. And for the first time in many years, Te Urewera was alone. The day after the storm I was travelling home after work and couldn’t help but stop to look at the view. 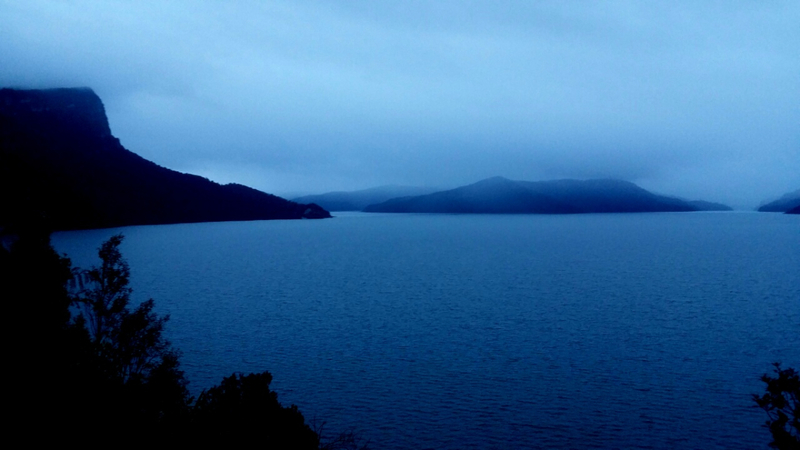 The mist was hovering above and coming down ever so slowly as if to blanket Te Urewera. The mountain ranges in the distant showing different shades of blue with the tip of some ranges lightly covered by the mist. Waikaremoana was still and calm and among all this there was silence. Seeing Te Urewera this way gave me the feeling she was having a long overdue rest she so deserves. Te Urewera has played host to millions who come from far and near to free their minds from the pressures of living in the so-called concrete jungles. Can you imagine hosting that many people in a year? I would definitely be drained and tired and planning a retreat away. Te Urewera plays a vital role in people’s lives, for some she’s a counsellor, for others she’s a friend. For whatever reason we visit this ancient being, she has the experience to host and offer a remedy we seek for the heart, soul and mind. For us humans, we have places to go to re-energise ourselves. But Te Urewera doesn’t have that luxury of going on a retreat. If she cannot go anywhere then something or someone has to come to her. Like a person, Te Urewera needs a break from all this. To me, Cyclone Debbie was the retreat that Te Urewera has waited and yearned for. I believe Cyclone Debbie brought goodness to this spectacular being. Debbie simply came and gave Te Urewera a total makeover. Old trees were pulled from their roots to give way to the next generation of trees. New waterways crafted providing sustenance to more of the land and its species and landslides formed a new layout to the land. Not only did Debbie change the shape and form of Te Urewera but it also freed her from human contact. So next time you’re in Te Urewera and you are here to find yourself or rejuvenate yourself remember you are not alone. Te Urewera is right there sharing the same reasons for your visit but she is also tending to your inner needs. If she can do that, then we should also contribute to returning the favour. Such a beautiful and we'll written piece. Te Urewera.Mauri Wairua Mana Na Tamariki, Na Rakau Manu Kararehe Koawa Mauna Te Kohu Urupa Wai Maori Na Turehu Na Tupuna Ka pai e Here they all need a well earned rest. I totally agree Te Uruwera does that for me for sure. We can sometimes call these events a natural disaster but that's just the prospective we look at it from. Where really for Te Uruwera it's a cleansing of all that raru from the people it needs to move & release from Papatuanuku. Absolutely wicked Here, and so right - We watched as Te Urewera rested for the first time in my life from hosting the many manuhiri over the many years. Every human being needs rest. Beautifully written! Thought provoking. This blog certainly captures the essence of Te Urewera that many of us have enjoyed and shared with others over years. Good word...a TOTAL MAKE OVER... EVERYTHING NEW WILL ARISE FOR THE NEXT GENERATION. I totally agree with that kōrero whenever I go back to rejuvenate I also know I am not alone, and I also have a tangi to myself because I will always leave the safety and comfort of my turangawaewae and back to the hussle and bussle of the big city lights. Neat alright e Dark Choco!! Te Urewera would love this article. Tino tika tahau Herehere, ma wai atu hoki e horoi naa paru, naa hauna, naa tutae me na hamuti oo tauiwi i tau mai ki roo oo te Urewera tanata mai i te hokikinaa oo Kura whenua kia tatau.